Borage is an easy growing annual herb plant with vivid blue flowers and leaves and flowers that have the flavor and scent of cucumbers. It is considered an herb but is often grown as a flower in vegetable gardens where it attracts pollinating bees and is considered a good companion plant for tomatoes, squash, and strawberries. It’s even supposed to deter tomato hornworms and improve the flavor of tomatoes growing nearby. Borage is actually a somewhat gangly plant, but you barely notice it because the star-shaped flowers are so vibrant. They start out pink and turn a true blue, hanging in downward facing clusters. Even the fuzzy white buds are attractive. Both the flowers and the leaves are edible, with a cucumber-like flavor. Use the leaves while they are young because as the plant matures, the stalks and leaves become covered with a prickly fuzz. Borage is an annual plant, so USDA Hardiness Zones do not apply. Although the original plants will not come back next year, they do self-seed readily. Don't worry. They are easy enough to pull out and won't become a nuisance. Borage grows best in full sun to partial shade. Growing borage plants in full sun will give you the most flowers and the stockiest plants. Borage can become a fairly tall plant, reaching a size of 18 - 36 inches (45 - 90cm) H x 9 - 24 inches (22 - 60cm) W. They can become rangy and floppy when they get top heavy with flowers. Growing borage in full sun will help make for sturdier plants. Borage can bloom from late spring through summer although the plants will start to decline if they are not deadheaded and are left to go to seed. Staggering your planting times will give you a longer period of bloom and provide a longer harvest time. If the flowers fade before you have a chance to deadhead them, the plants will re-seed on their own. As mentioned above, borage is often grown in the vegetable or herb garden because it is such a magnet for bees and other pollinators and because it is considered a good growing companion for other plants. However, it is equally beautiful in a cottage style flower garden, where it has room to self-seed. Harvesting or deadheading will keep it in bloom longer. Borage grows best if directly seeded. Barely cover the seeds with soil and keep well watered. The plants are tolerant of any type of soil, even poor dry soil. However, a sunny location with rich, well-draining soil is optimal. Amending the soil with some type of organic matter, such as compost, will give your borage plants a boost. If you choose to start seed indoors, transplant before they become pot bound. Plan to start seedlings about 3 to 4 weeks before the last expected frost and don’t transplant outdoors until the soil has warmed and the plants have been hardened off. Once seedlings are about 2-3 inches tall, thin to approximately 12 inches apart. Plants in poor soil will benefit from periodic feeding with any fertilizer labeled for use on edible plants. Something with a high phosphorous number (the middle number on a fertilizer package) will help keep them in flower. Plants can be pinched or pruned, to encourage branching and keep them shorter. 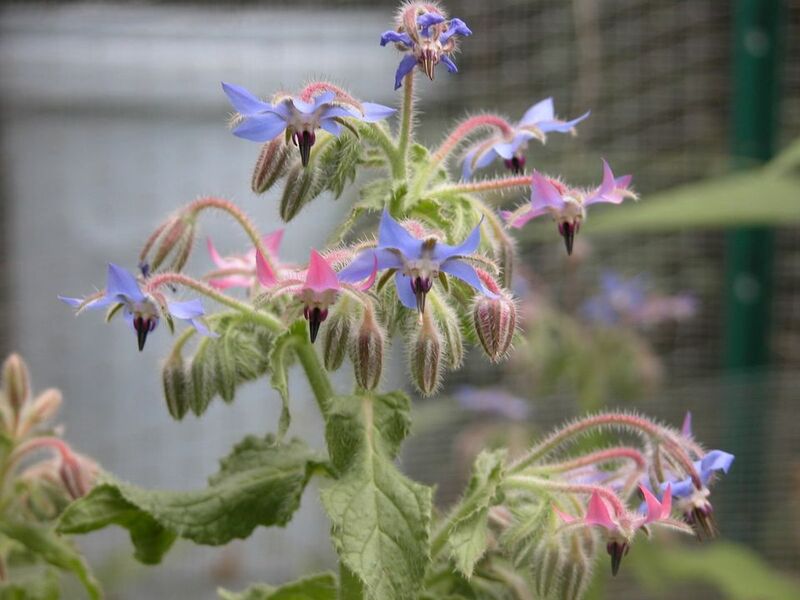 Borage is open pollinated and it is very easy to collect and save the seed from flowers allowed to remain on the plant and turn brown. Borage self-seeds readily if allowed to go to seed naturally. Excess plants are very easy to remove from the garden. Harvest leaves and flowers as needed. Older leaves will get prickly, making harvesting anything on the plant a bit unpleasant. However, the flowers do add a bit of flavor and a great deal of color to salads, soups, dips & spreads, open face sandwiches, beverages, and ice cubes. As with all edible flowers, use sparingly until you know how they affect you, especially if you have plant allergies. Borage is also said to have a mild laxative effect. Borago officinalis is probably the only borage you will see offered by seed companies. Borage is virtually problem-free. Nothing wants to get too close to those scratchy leaves! More on adding blue flowers to your garden.